One of the great traditions of college football is the pre-game speech. It’s a tradition that the average fan doesn’t usually get to experience, however, as these intimate moments between the players and the head coach take place in the locker room before the team takes the field. 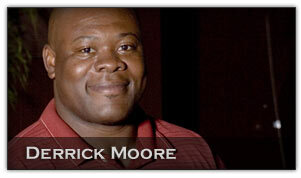 But when former NFL player Derrick Moore became the Georgia Tech chaplain, something different began taking place. Due to the close relationship he quickly developed with players (and his unique motivational skills), head coach Chan Gailey occasionally asked Moore to get the team ready ahead of some of the Yellow Jackets’ games. Such was the case on September 1, 2007, when Georgia Tech traveled to South Bend, Indiana, for its season opener against Notre Dame. The Fighting Irish had long dominated the series and entered the game with an overall 27-5-1 record. Just minutes before the Yellow Jackets were scheduled to take the field, Moore began to share a heartfelt message with the team. After giving a few last-minute words of wisdom from his middle school coach, Moore then began reciting a popular Bible passage that is better known as “The Lord’s Prayer.” One line into the prayer, Moore stepped away and let the players take over. With one last shout of encouragement, Moore ushered the team onto the field where they proceeded to overpower Notre Dame en route to a surprising 33-3 victory in front of 80,000 disbelieving fans. It was the first time Georgia Tech had defeated the Fighting Irish at Notre Dame Stadium in 48 years. The rest of the season turned out to be an up-and-down affair, which assuredly gave Moore many opportunities to provide spiritual counseling and mentoring for a young team going through growing pains. But come game day, he would once again lead them in that biblical prayer and recapture their spirits with the words of his old coach. Dear Lord we thank You that we can come to You for our daily bread. Thanks for giving us the words that show us how to pray to You. In the Name of Jesus, Amen.